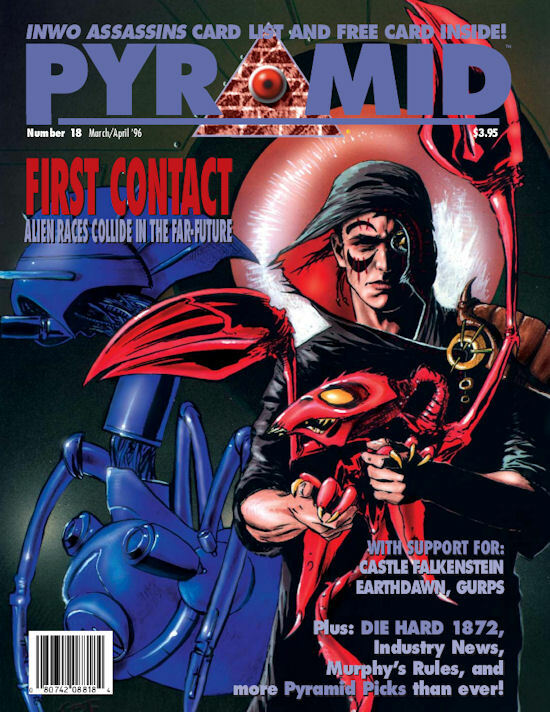 Pyramid was released continuously between 1993 and 2018, ending its third volume in December 2018 with Pyramid #3/122: All Good Things. It began life as a print publication before migrating to electronic horizons. Here is a brief look at its previous two incarnations. 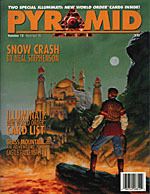 The first volume of Pyramid was a print publication, available in fine game shops everywhere. 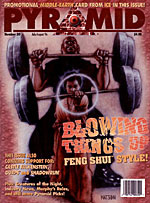 It ran 30 issues, from May/June 1993 to March/April 1998. This was a general-purpose gaming magazine (with a heavy dose of Steve Jackson Games-related material), covering RPGs, card games, computer games, and other genre gaming. It also covered industry news and developments. Electronic PDF versions of all issues from this volume of Pyramid are available for purchase via Warehouse 23. 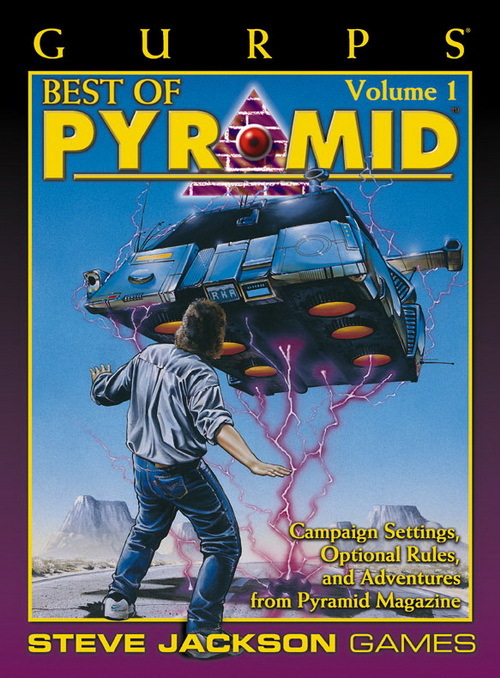 Some of the best GURPS Third Edition material from the first volume of Pyramid was compiled into two books. 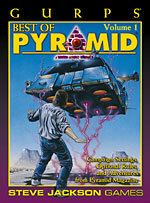 GURPS Best of Pyramid Volume 1 contained the vehicle-centered campaign setting "Sprockets," high-powered rules including "Brain Hacking" and "Willful Weapons," and unique adventures such as the zombie-horror "Trespasser's Isle." 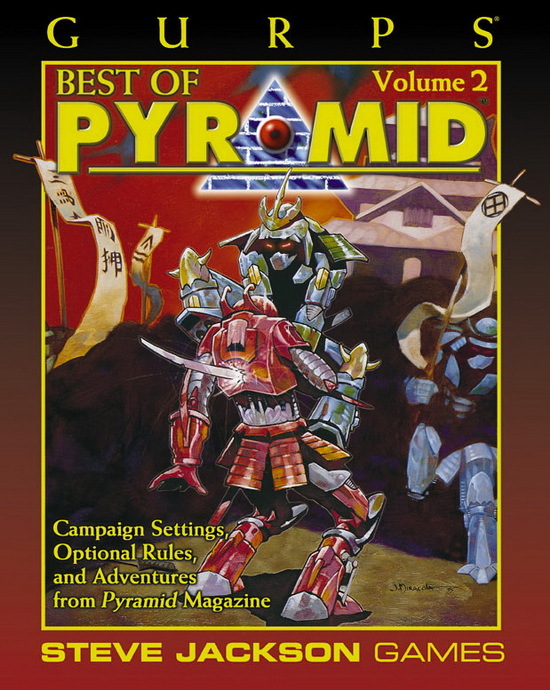 GURPS Best of Pyramid Volume 2 contains other treasures from this era, including the complete run of Terra Incognita and Warehouse 23 from Pyramid Volume 1. 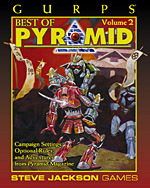 The second volume of Pyramid was an online subscription-based website. 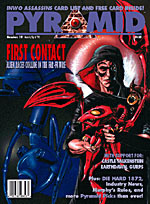 It ran from April 1998 until November of 2008 – a total of 558 weekly "issues"! 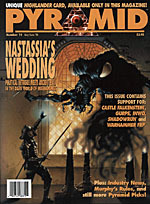 It followed a similar mandate to the first volume, being devoted primarily to RPGs but also CCGs, miniature gaming, computer games, and other genre gaming topics. 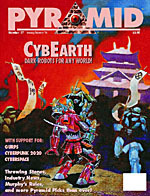 It had a frequently updated news section and also provided occasional in-depth reports on topics of interest to gamers. 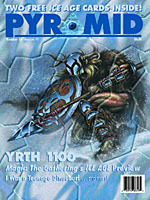 Pyramid Issue 11 was the official INWO Preview issue, with articles by Steve Jackson and Scott Haring and dozens of card art examples. 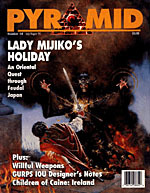 The issue also featured GURPS Tékumel, a GURPS conversion for the classic Empire of the Petal Throne roleplaying game, plus the usual columns, industry news, reviews, Bruno!, and Murphy's Rules! A special Pyramid at a special price! 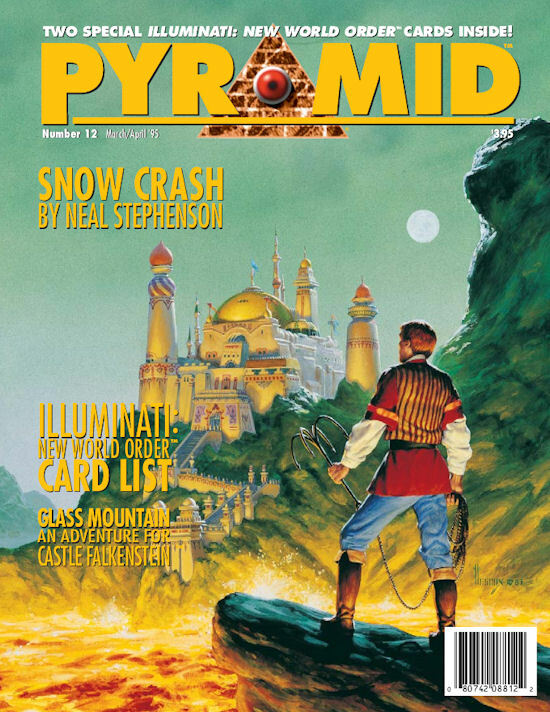 Pyramid Issue 12 features a ton of coverage of INWO, including the official card list for the Limited Edition and complete Tournament Rules; an adventure for Castle Falkenstein; GURPS CthulhuPunk Designer's Notes; a sneak peek at In Nomine; and the usual industry news, columns, Bruno!, and Murphy's Rules. 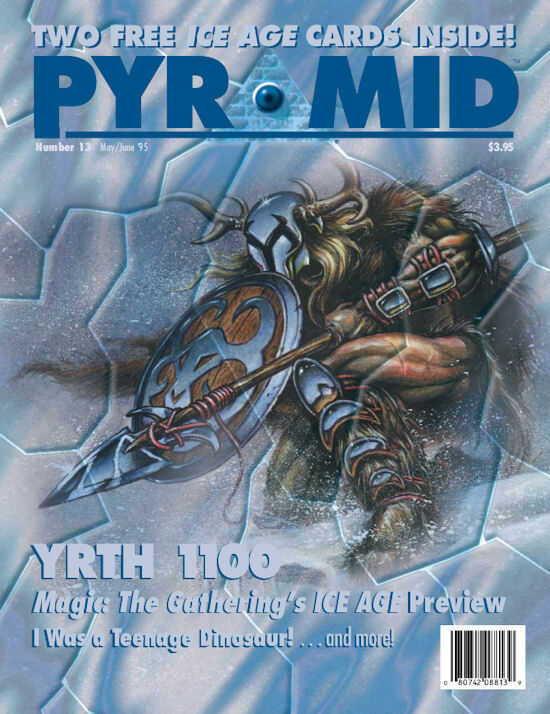 Issue 13 of Pyramid was far from unlucky, featuring Steffan O' Sullivan's "Yrth 1100" campaign for GURPS Fantasy 2/e, an adventure for GURPS Atomic Horror 2/e, Designer's Notes for GURPS Places of Mystery, and more! There's a sneak peek at the Ice Age expansion for Magic: The Gathering, a generic Old West setting, and more goodies for INWO, along with the usual industry news, columns, reviews, Bruno!, and Murphy's Rules! 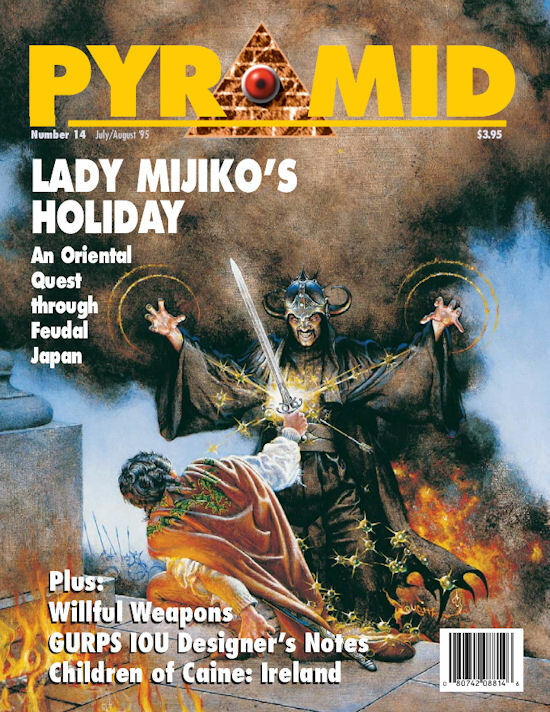 Issue 14 of Pyramid features "Lady Mijiko's Holiday," a complete adventure with stats for four different games, including GURPS, Bushido, RuneQuest Land of Ninja, and AD&D Oriental Adventures. We also have Designer's Notes for GURPS IOU, a new bloodline for Vampire: The Masquerade, articles on "Willful Weapons" and fancy new archery equipment, plus the usual columns, industry news, Bruno!, and Murphy's Rules. 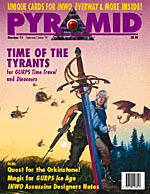 Issue 15 of Pyramid was published in September of 1995. 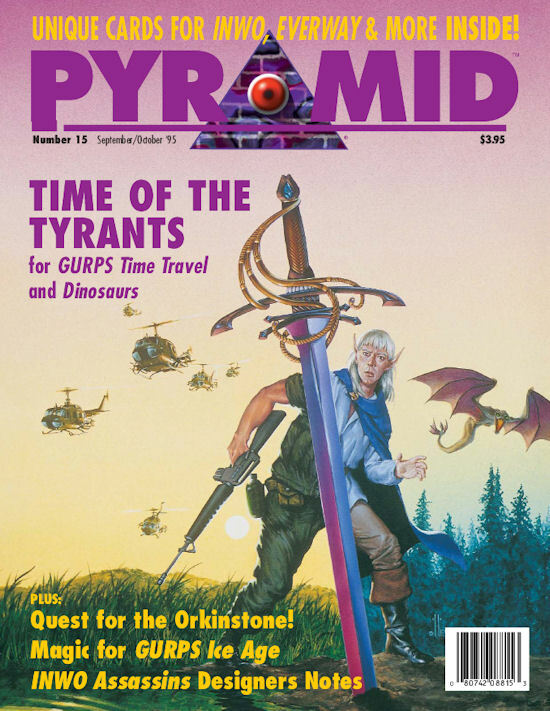 The lead article, "Time of the Tyrants," is a complete adventure suitable for GURPS Cliffhangers, GURPS Time Travel, or GURPS Dinosaurs. Steve Jackson spills the beans about INWO Assassins, there's a complete Toon adventure, plus support for GURPS Ice Age and GURPS Cyberpunk. All that, plus the usual industry news, cartoons, columns, Q&A, Supporting Cast, Warehouse 23, and more! 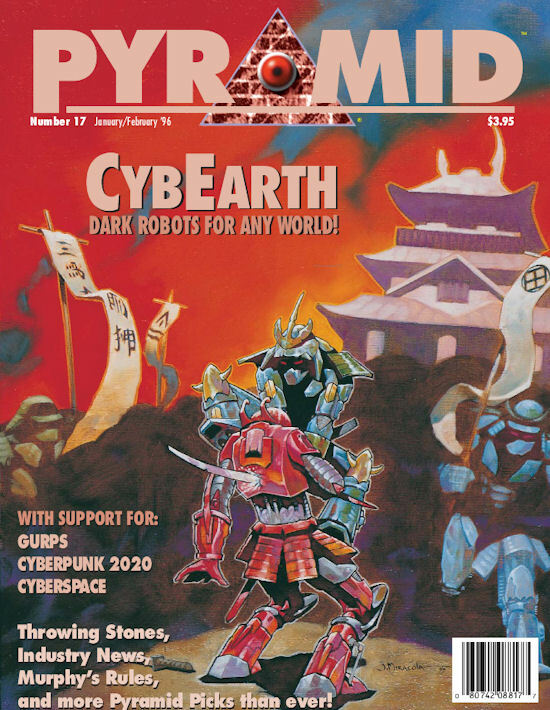 Issue 17 of Pyramid features a complete cyberpunk adventure wiht stats for three different systems, plus "CybEarth," a complete science-fiction game world featuring sentient robots trying to emulate a long-dead society. There's also articles on Tech Magic in GURPS, designer's notes for GURPS Celtic Myth, and an article on Mirror Magic. All that plus reviews, industry news, columns, Q&A, letters, Supporting Cast, the very first Adventure Pizza, Bruno! times two, and Murphy's Rules! 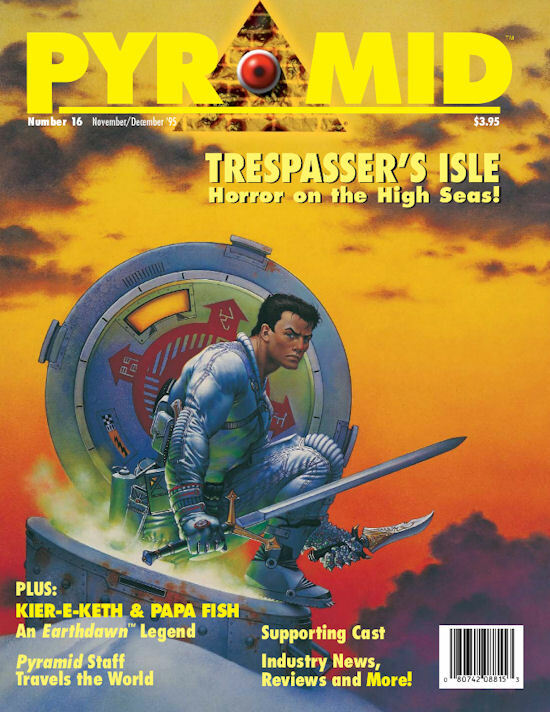 Issue 18 of Pyramid features a complete science-fiction adventure with GURPS stats, plus "Die Hard 1872," a complete Castle Falkenstein adventure. There's also a grimoire for Earthdawn, a generic fantasy adventure idea, and previews of the Mythos CCG and INWO Assassins, the first supplement for INWO. All that, plus reviews, industry news, columns, Q&A, letters, Supporting Cast, the very first Adventure Pizza, Bruno! times two, and Murphy's Rules! 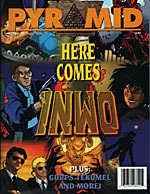 The only thing missing is the free INWO Assassins card promised on the cover – it's not available in this PDF. 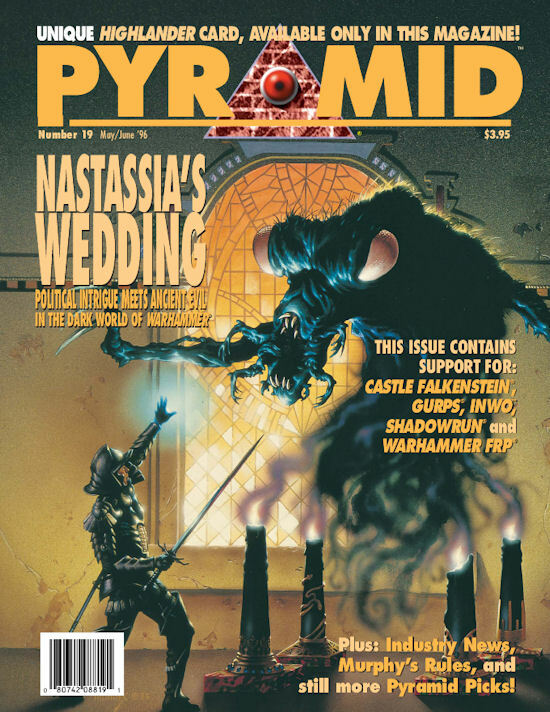 Issue 19 of Pyramid features a complete adventure for Warhammer Fantasy Roleplay, lycanthropes in Shadowrun, artifacts for Castle Falkenstein, and a new race for GURPS Aliens. 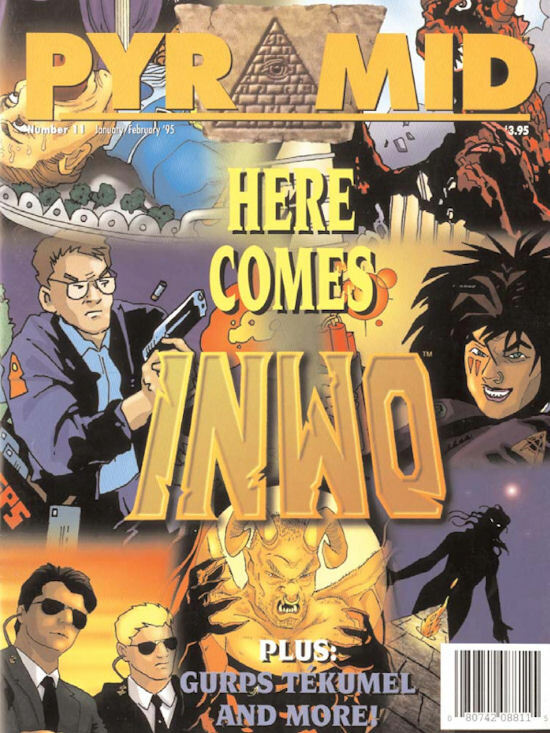 There's also plenty of coverage of INWO, with details on the 1996 world championship tournaments and INWO OMNI, a new way to play at conventions. All that, plus reviews, industry news, columns, Q&A, letters, Supporting Cast, Warehouse 23, Bruno!, and Murphy's Rules! The only thing missing is the free Highlander card promised on the cover – it's not available in this PDF. 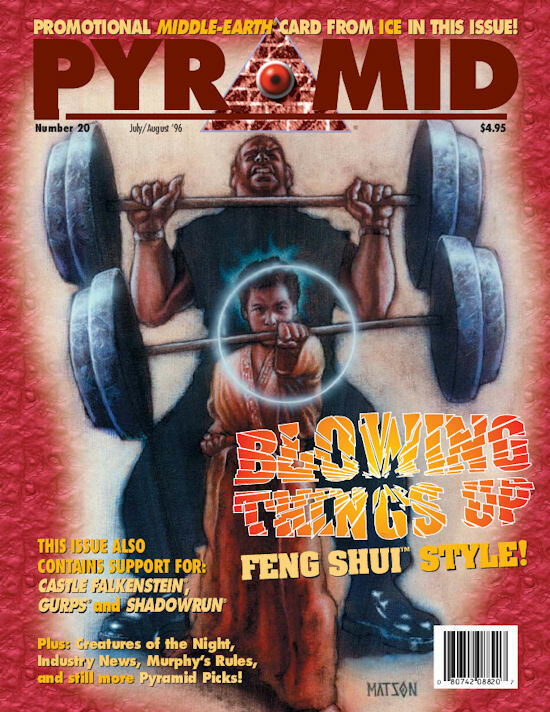 Issue 20 of Pyramid features a complete adventure for GURPS Goblins, an adventure for Castle Falkenstein, new Idols for Shadowrun, and new martial arts styles for GURPS. All that, plus reviews, industry news, columns, Q&A, letters, Creatures of the Night, Adventure Pizza, Bruno!, and Murphy's Rules! The only thing missing is the free Middle-earth card promised on the cover – it's not available in this PDF.